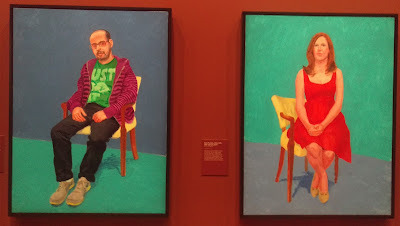 One night I was out with my friends and we happened to find ourselves at the National Gallery of Victoria. Actually, it was a festival in Melbourne called White Night, where the city is basically open all night, as are a lot of the galleries and museums, however this isn't post about White Night (you can read it here, and here - I've been twice) but rather about one of the exhibitions at the gallery. We didn't go into the gallery to see the exhibition though, but rather to check out one of the paintings (the one by Rembrandt, of himself). 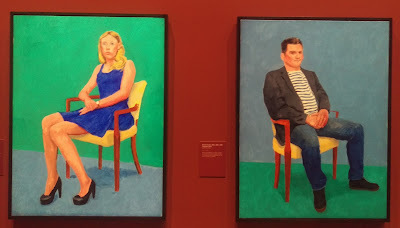 At the time the major exhibition was of a fashion designer (the NGV seems to have fashion designer exhibitions over the summer period) so I almost missed the one tucked away in the corner, that was of Hockney's latest works. 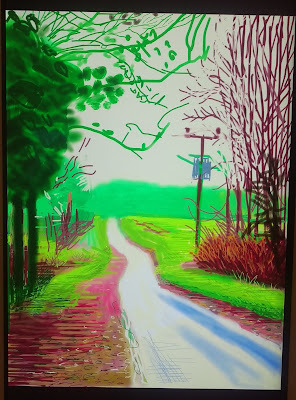 Hockney is a living artist who was born in Britain to Laura and Kenneth Hockney (who happened to be a conscientious objector to World War II). 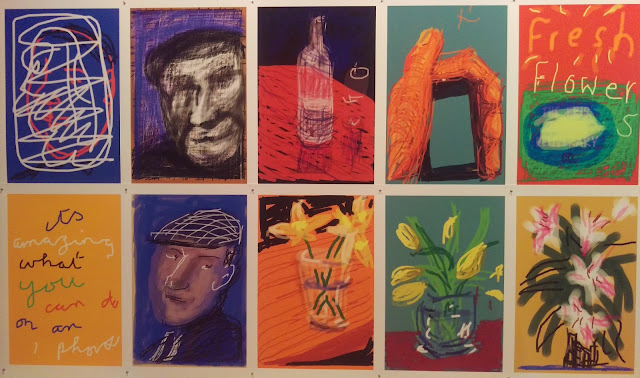 He studied at the Royal College of Arts in London where his work was featured in an exhibition, alongside Peter Blake, bringing pop art to England. He then visited California where he began to experiment using acrylic. 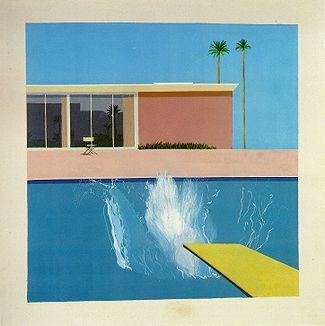 Many of these paintings are of swimming pools, such as the one below called 'A Bigger Splash'. This experimentation is something that would characterise Hockney's approach to art. He would always look at using new methods and technologies to explore ways of creating his works. In this exhibition many of his works that he created between 2009 and 2015 were on display. Interestingly these works were created using iPads and iPhones. In fact a lot of them were on display using the device, while others had been printed out and simply stuck to the wall. Mind you, this raises the question of whether it actually is art, since the one thing about art is that it tends to be unique - computers change all of that. When the image is digital, it can easily be copied without any decrease in quality. 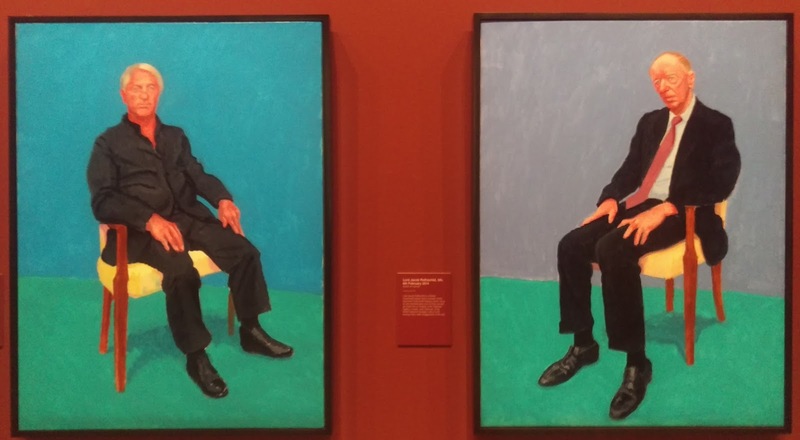 There is only one Mona Lisa, but there can potentially be millions, or even billions, of Hockney's works. Many of these works are unnamed and unlabeled - we simply see them as is. 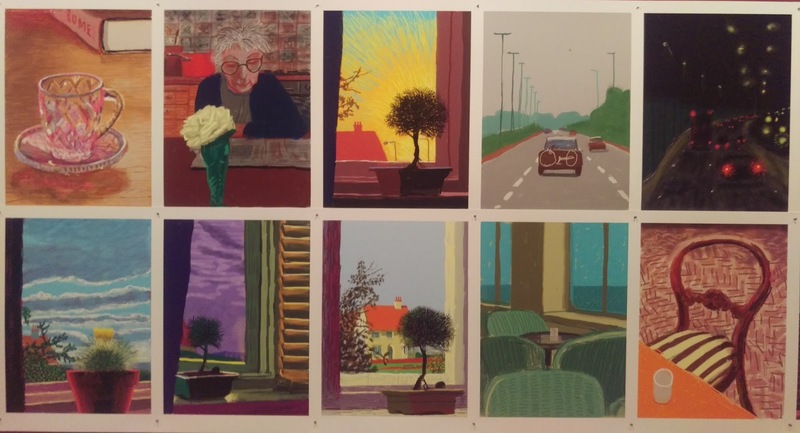 So, without further ado, let us delve into some of Hockney's works. This is a flower in a glass. In a way these images seem to be pretty rushed, yet it raises the question as to whether it is art or whether it is just some scribbling on an iPad. Another flower. I'm sort of wondering where the image has somehow been degraded due to the fact that I am taking a photo of a iPhone with my own phone (which uses the Android system). Yet it also makes me wonder whether it is the name that adds the value to the image as opposed to the image itself. Anybody can take a photo of an old man on the street, but if it is Andy Warhol who is taking the photo then suddenly it is art. 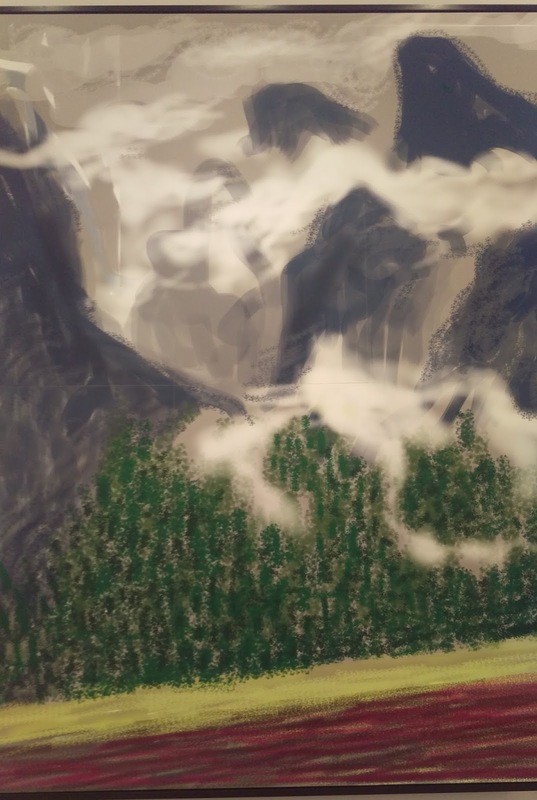 I'll call this 'It's Amazing What You Can Do On An Iphone' namely because that is what he has scribbled in the corner. Mind you, such art has been around for quite a while with programs like, well, Windows Paint. I even remember the days of the Commodore 64 where we had demos which included both graphics and sound. 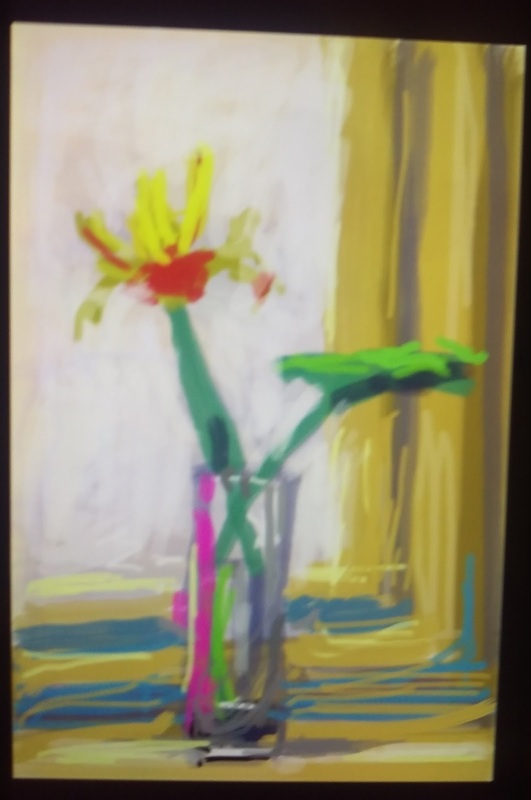 Yet, unlike a computer, iPhones are portable, which gives the artist much more flexibility. 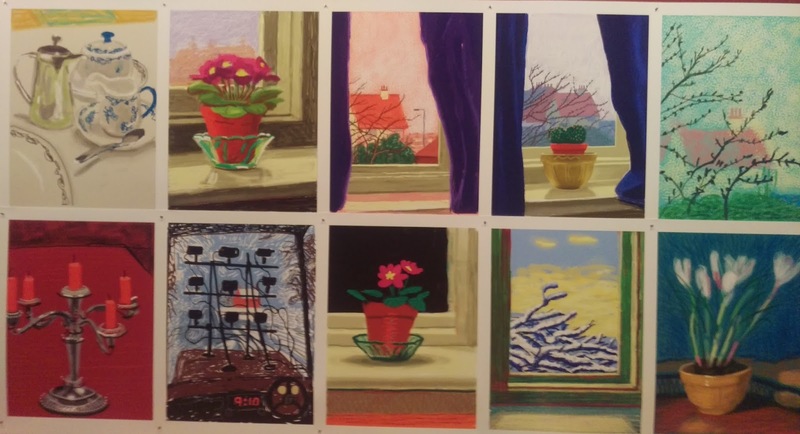 Hockney seems to create a lot of still lifes, and portraits. The difference with the iPhone though is the touch screen. At first Hockney would simply manipulate photos, but later moved to creating the works from scratch. The two pictures of cars on the road also show how one can now create art while sitting in the front (hopefully passenger) seat of the car. Okay, one could have used a sketch pad, but this is the iPhone we are talking about. Some of these sort of remind me of the paintings of Van Gogh. Another still life, of a chair, this time with clothes thrown over it. 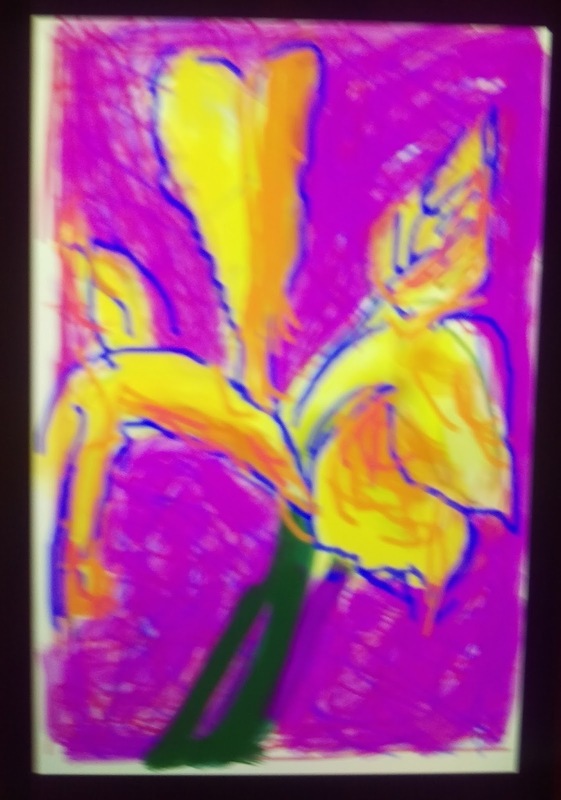 This one, and the next few, were done using an iPad, which is much bigger than the iPhone. Personally, I find the pads easier to use due to the size, and reading stuff on them is much better as well. I still find it odd that the pads came out after the phones. 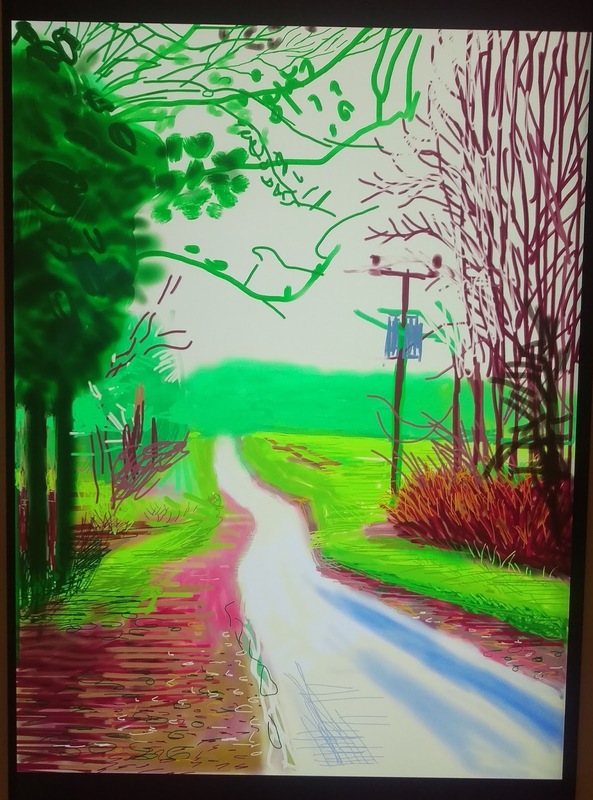 The thing about this exhibition was that it had more to do with completeness, and also showed the development of Hockney's ability to draw using these new devices. The first lot obviously demonstrate an artist using a new medium, but the more he uses the medium, the more skilled he becomes. Here are some more still lifes. His output was certainly quite large, and these are some more examples. 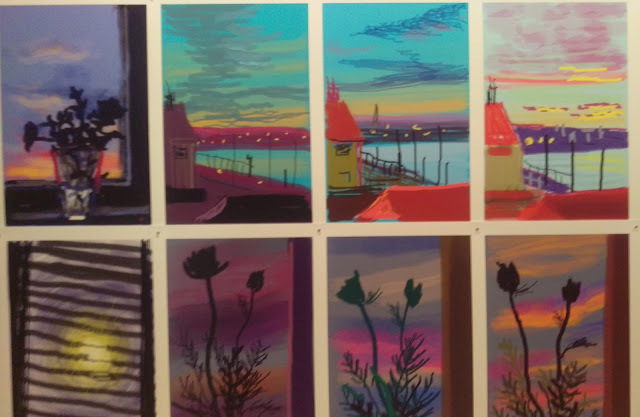 However, note how he is exploring different periods of the day and how colours change over the day. Artist do similar things with regards to the seasons of the years. 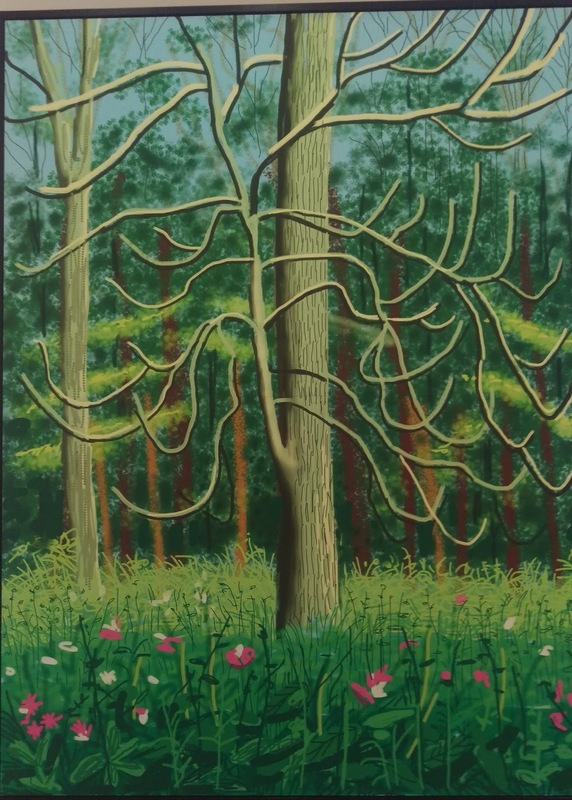 This is called 'Bigger Trees near Water' which was created in collaboration with French artist Jean-Pierre Gonclaves. Interestingly Gonclaves calls this 'Peinture sur le motif pour le nouvel age post-photographique' which basically means a painting in the new, post-photographic age. This is an interesting concept because the suggestion is now that art has entered in digital age. If you look at this image closely you will note that it is made out of lots of individual sheets. Not only does art cease to be unique, but the original size no longer matters. 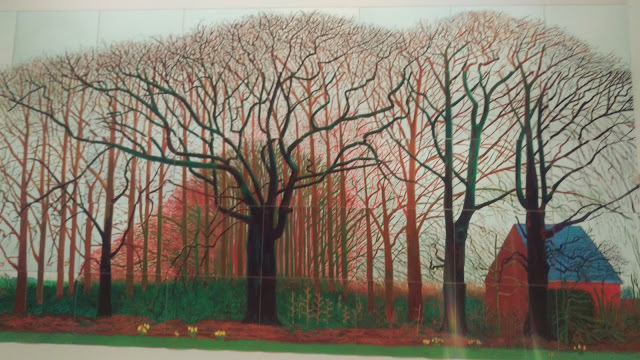 In 2011 Hockney moved to Yorkshire where he created a number of works called 'Yorkshire in Spring'. Here, like a lot of artists on the modern era, the focus was mainly upon colour. This is another of the drawings, though I'm not sure how they would be describe. A painting is a specific type because it is created using paint, and a drawing is technically created using pencils. Yet using the word 'image' doesn't really create the artistic merit. Notice the difference is skill level compared to those at the beginning. The next room contained a series of portraits that Hockney had created. However, unlike the previous images these were created on Acrylic. These are paintings of Douglas Baxter, President of the Pace Gallery, and Lord Jacob Rothschild (and investment banker, but I suspect that we already knew that). This is Avner Chaim, an artist from Tel Aviv, and Kate Pyrnoos, an immigration lawyer in California. 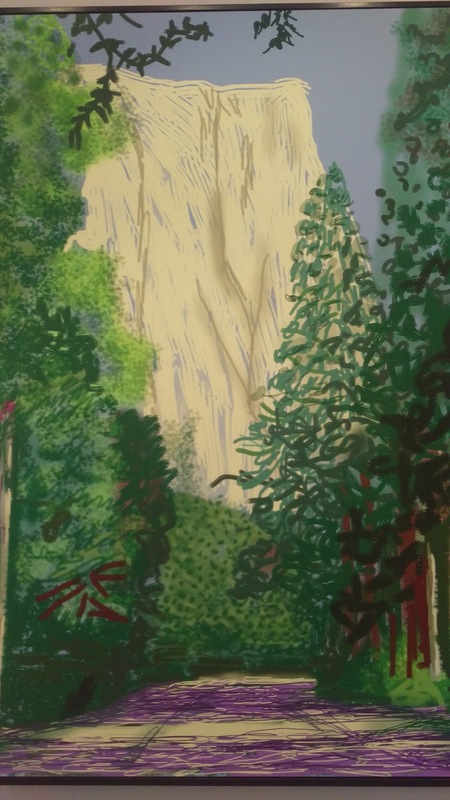 Finally we have Chloe McHugh, who was an intern with Hockney, and Kevin Durez. The next couple of drawings came from the next room which was focused on drawings done in Yosemite. 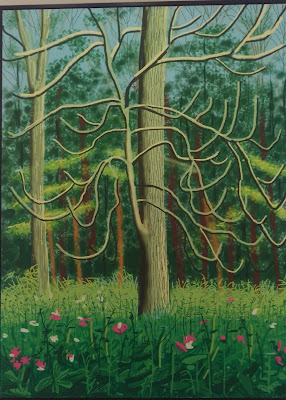 This was in contrast to the 'Coming of Spring' drawings, which were done in a Yorkshire forest. Here the landscapes are much vaster, and the colours also quite different. And so this brings us to an end of another post on an exhibition that I saw, though it was a while back now. 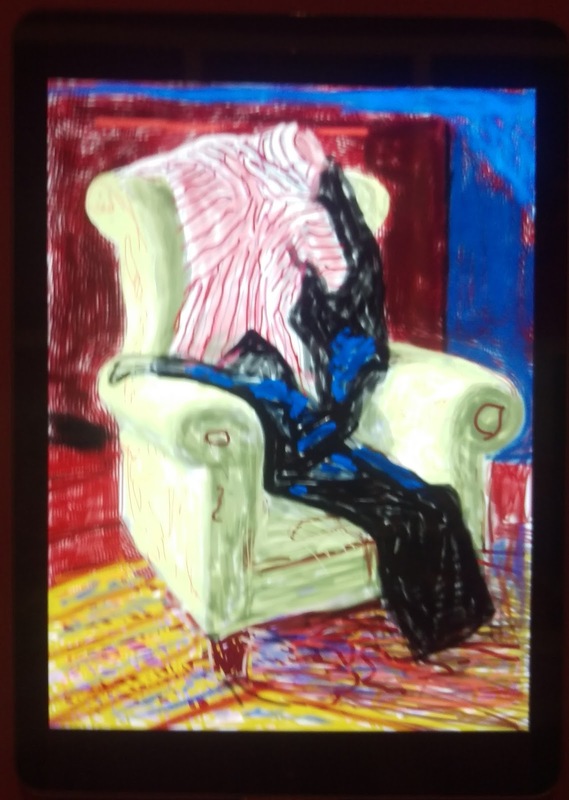 There were a couple of more galleries, but the thing is that the main focus of this exhibition was his experiments with the iPad, a new medium. As we have seen he has developed quite a lot over the years since he first decided to play around with it. Whether this is art in the traditional sense is debatable, but he certainly can use it much better than I can.